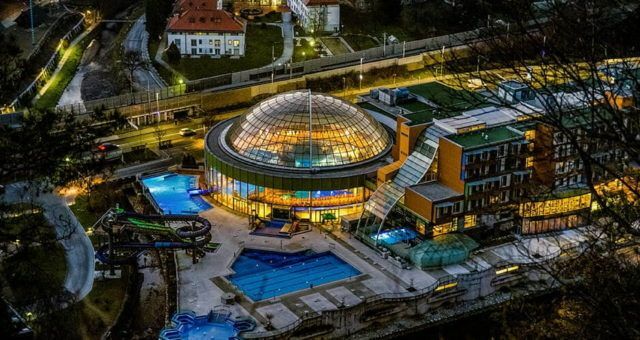 Thermana Park Laško that includes the Thermal Centre with swimming pools and saunas nested under one of the largest domes in Europe is celebrating the 10th anniversary of its opening. Certainly the opening on a Valentine’s Day in 2008 was a proper time for opening such a romantic and breathtaking glass dome that offers a different experience of a relaxing and healing time in a thermal wellness of any kind. The previously called Zdravilišče Laško, founded over 160 years ago, helped countless people to restore health and maintain well-being through thermal water and expertise of the employees. In 2008, the Zdravilišče Laško, mostly directed towards the segment of medial rehabilitation, has outgrown its frames and became an intersection of a much wider offer that has united into Thermana – the company of well-being. Grounded in the power of the Laško thermal springs that were well known even to the Romans, the Thermana has evolved into one of the most modern center of medical and wellness tourism in Slovenia. Thermana Park Laško offers medical programs, thermal and wellness programs, care for the elderly, business, conference and seminar tourism, tourist starting point for exploring Slovenia and other programs of hotel industry, catering and tourism. In 2017, Thermana Laško won the 2nd place in the category of the best thermal resorts at the European Health & Spa Award 2017 in Vienna, where among the 100 competing companies, Thermana Laško was the only Slovenian representative. Its congress offer is also breathtaking. The modern congress centre offers 10 halls for up to 1.100 participants. The halls have natural light as well as the possibility of dimming, plus the superb high-tech equipment and modern ambience. The congress guests can enjoy in the superior accommodation of the Hotel Thermana Park Laško (4* Superior) that is distinguished by its high quality accommodation and a well-rounded range of servies in one place (wellness, medical and catering services).